Photo courtesy of the Smithsonian; © all rights reserved. 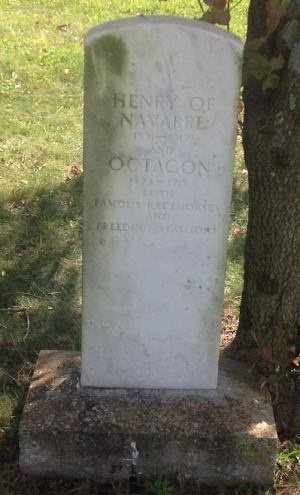 Stone marking the graves of Octagon and Henry of Navarre at Front Royal, now part of the Smithsonian Institution. HENRY OF NAVARRE and OCTAGON were both donated to the U.S. Government to jump-start a new breeding program for the U.S. Remount Service by their owner, August Belmont, early in March of 1911. In late March the horses were both brought back from France, where they had served as stallions at Belmont's Haras de Villers in Normandy; Octagon had gone there in the fall of 1908, and Henry of Navarre in 1910, after spending the 1909 season in England. Four other Belmont-donated thoroughbred stallions soon followed, eventually joined by stallions of other light horse breeds. Virginia horse owners were encouraged to breed their "cold blood" mares; the government had the option of first right-of-purchase on the foals, initially set at $150 each. Hundreds of half-bred horses were produced, many of which went to mount the U.S. cavalry and to serve as artillery horses, and a number also ended up as saddle horses, hunters, and show horses in and around Virginia. HENRY OF NAVARRE (1891-1917) was one of America's great racehorses, a champion at ages three, four and five. He was not, however, a good sire of racehorses. His most notable offspring was a filly, Grave and Gay, that won two mid-level races in England for American W.C. Whitney, who had shipped a large number of his horses to England to race in the early 1900s. After her career was over, she was purchased at the December 1906 Newmarket sales by the Weinberg brothers of Germany, where she became a celebrated broodmare with many winning descendants. OCTAGON (1894-1918) was bred and raced by August Belmont, and at age three won a number of high-class races in the U.S., and continued to win through age five. He had better success in the stud, compared to HENRY OF NAVARRE, getting Beldame, the champion three-year-old filly in the U.S., U.S. Hotel Stakes winner Woodsaw, and, in England, Two Thousand Guineas winner Norman, and in France, Prix Monarque winner Amoureux.